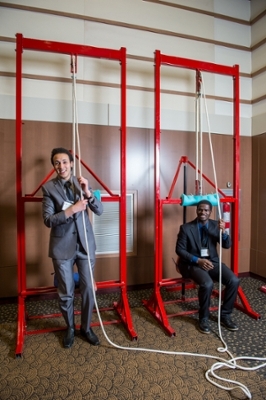 The second annual UNB Engineering Design Symposium was held on March 31at the Fredericton Convention Centre, where final-year engineering students presented their capstone design projects to potential employers, industry and community partners, and the public. 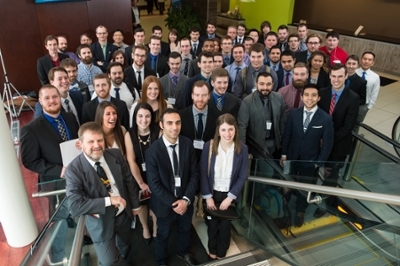 Every engineering stream was represented: chemical, civil, electrical & computer, geodesy and geomatics, geological, mechanical, software, and UNB’s Technology Management and Entrepreneurship program. The students, many of whom worked on a project sponsored by industry or government partners, had the chance to demonstrate how their prototype worked, as well as host a public presentation. 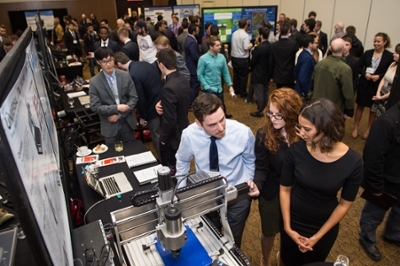 More than 600 people – engineering students, faculty, and staff, along with UNB engineering alumni, industry partners, and the general public – walked through the rows of design projects. “The Engineering Design Symposium was a great success,” said Dr. Michel Couturier, NSERC-UNB chair for collaborative engineering design education. “Our students were able to present their projects, the result of seven months of design work." Top prizes were awarded to the best in each engineering discipline. In total, more than 60 students received recognition for their projects. But everyone impressed at the symposium.